My sleeping schedule is wacked. I stopped drinking coffee, then had a double cappuccino at 10pm and stayed up until 4:30. Woke up at 7:00am-ish for three nights in a row, camping. Now back in the real world, woke up at 7am again. North Beach is nice in the morning- folks hosing down the sidewalks from the debauchery of last night, waved to my mechanic, door guy at TransAmerica building (the most friendliest person in the world, by the way) and power walked with other ladies of my age at Aquatic Pier. 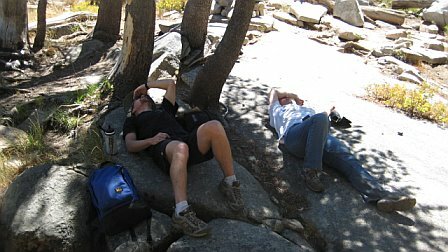 Above is a nap on a granite field with my brother-in-law. Good times. I managed to write three blog posts on BART. Now, that is multi-tasking. I composed them in my head on the way to BART, then typed them up on the train. In fact, I got free wi-fi in Embarcadero station while the train was idling there. What wi-fi can make it that far? Two serious stories below Market Street. Hmmm. (Posts are: Adventures in Email Marketing, “Sourcing Leads in Lodi, CA” & Kulturblog, “A Very Short Review of FotC: New Fans”, and SF Metblogs, “BART Seduction”. Not the Greatest American Novel, but still, helped me stay au courant. Written Tuesday, August 21st, 2007 in about writing, local color, walk to work. You can leave a response, or trackback from your own site. BART has its own wi-fi for the company, but you would’ve had to known what to set it to. T-Mobile, Verizon and AT&T wireless cards work down there on the same signal as the cell phones. Powell St. Station has the best signal throughout the station.